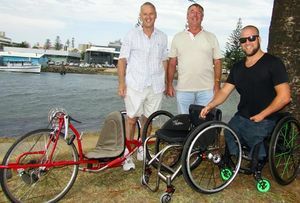 Recent multiple NSW Institute of Sports Award winner Ryley Batt has donated a wheelchair and hand-cycle to the local TAD Disability Services (TAD) Group to support people in the Port Macquarie area with disabilities. Ryley donated his recently retired items to the TAD Group for the local volunteers, John Brumby and Michael Smith, to refurbish and sell, with the proceeds being used to purchase workshop equipment for the group to continue to design and build custom equipment to help locals to lead more independent lives. The TAD Group have made a broad range of custom equipment including a transfer handle for a man with multiple sclerosis to move between his wheelchair and car seat, a range of supportive seating and other equipment for children to actively participate in school and they also support the Freedom Wheels modified bike program for children who often cannot walk independently, to be able to ride a bike with their friends. In addition to his world class sporting career, Ryley works for GIO who are a Platinum Partner of TAD. “I’m thrilled to donate a hand-cycle and wheelchair to the great people at TAD. It’s also great to be able to give back to the community that has given me so much in my life.” Ryley Batt, Paralympian. “We are very grateful for Ryley’s generous donation of the wheelchair and hand-cycle which enabled our TAD Port Macquarie Group to raise funds which will be used to acquire more specialist tools. We have also benefitted by learning more about this type of equipment during the process of refurbishment.” John Brumby, Coordinator, TAD Port Macquarie Group. Thank you to Ryley and GIO Insurance for your ongoing support!